Delivering a powerful message fast: That’s why you use custom postcards produced by us. 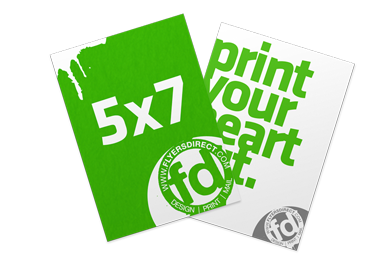 Depending on how much information you want to deliver, your budget and how visible you want your postcard to be, you have a choice of using standard 4 x 6″ cards or larger 5.5 x 8.5″ cards. These full-color printed pieces are low cost, inexpensive to mail and extremely versatile. They can be used for numerous purposes, including event promotions, gallery openings, concerts, parties, Save the Date notices, product launches and announcements, direct mail campaigns, and much more. A well-designed postcard can also brand your product or company. They are easy to handle and quick to read. Whether part of a direct mail project or distributed at locations, postcards deliver a glossy, focused and clear message. In addition, postcards offer a front and a back, allowing you two opportunities to provide information. We specialize in high-impact postcard printing and can provide expert design services that will help make sure that your postcards demand and get attention.